Script performance for your message. Description of voice: Conversational, friendly, warm. Young woman, nurturing mom and knowledgeable professional are all in my range. Tell me what else you need! Rodney Saulsberry (California, USA) Just like a professional athlete gets regular coaching to stay on top of their game, so do I. Rodney is a very accomplished voice actor in his own right, and he pushes every month. We focus mostly on commercial and narration coaching. Gravy for the Brain Gravy for the Brain is wonderful for getting an overview of the global voice over industry and ongoing training in different VO genres, as well as the business aspects of VO. Trainings I've taken include basic home studio check ups, Commercial, Narration, Telephony/IVR and Character VO. 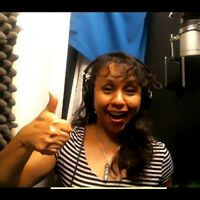 Ann Ganguzza-Global Voice Acting Academy-Telephony IVR Ann is a well-recognized talent, teacher and coach in multiple genres. IVR is one of her specialties. Big Voice Productions-Ron Allan USA Ron is a 20+ year veteran of voice over and production and trained me in basic recording settings, and VO delivery including Commercial, Narration, Telphony/IVR.